We love jam – on bread, a fresh crispy baguette, brioche, or toast. But mention Corsican fig jam, and it takes on another delicious and serious role: it’s served primarily with strong cheese. 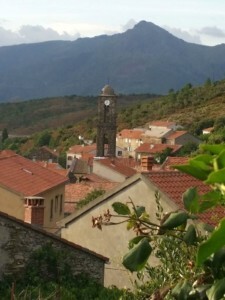 Perhaps you know that my husband, Antoine, is Corsican (Colonna in Corsica is like Smith in England). Cheeses from his “Island of Beauty” (l’île de beauté) are made from sheep’s milk or goat’s milk and many of them are, well, rather pungent. 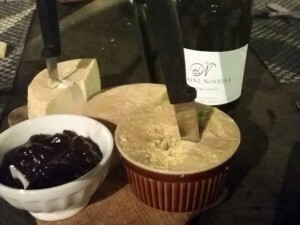 So the addition of fig jam is the perfect marriage on the cheeseboard since its sweetness helps put out the fire. I say fire, since some Corsican cheeses can be so powerful that Antoine’s grandmother used to keep the robust ones under the chimney, letting their aromatic fumes drift off around the mountain village. She claimed that if she kept one in her fridge, she would have to throw it out: the fridge not the cheese! As a naïve newcomer to the village, I was introduced to Casgiu Merzu by Antoine’s grinning uncle, or Tonton. Rather than be Jill, I’ll be Frank: it’s the most dangerous cheese I know on this planet since it looks like an innocent little potted cheese with a knife or spoon. Imagine roquefort but multiply its strength by about ten. This has to be the cheese that exploded the boat in Asterix in Corsica. I downed the whole bowl of fig jam! 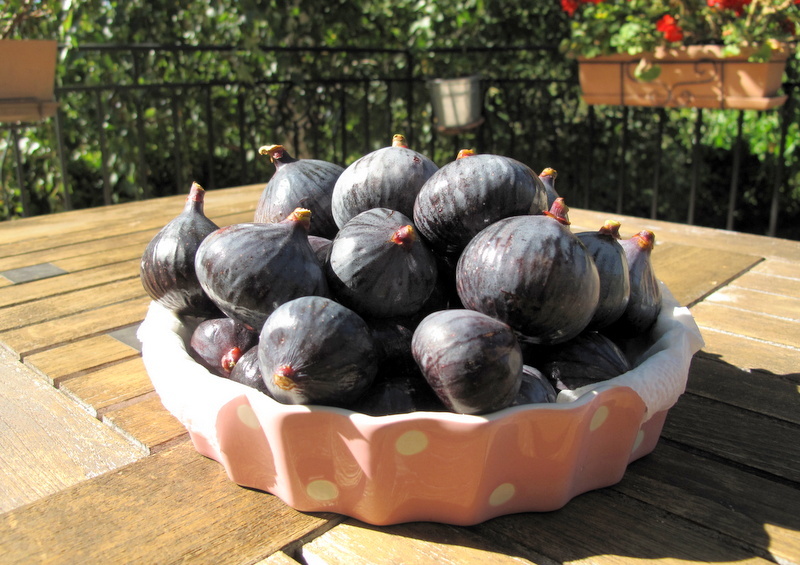 Now that it’s such a glorious fig season to see out the summer, I’m preserving the figs as much as I can so that we can enjoy the cheeseboard en famille in Corsica again this Christmas. I wonder if Father Christmas would dare to come down the chimney? Just as I was about to post this fig jam recipe, I’ve had an exciting delivery thanks to the lovely people at Terraillon. It’s a digital jam scale! Isn’t that clever? (see my review here) I’m off to stock up on more end of summer fruits and try it out for you for another of my favourite preserves next week. 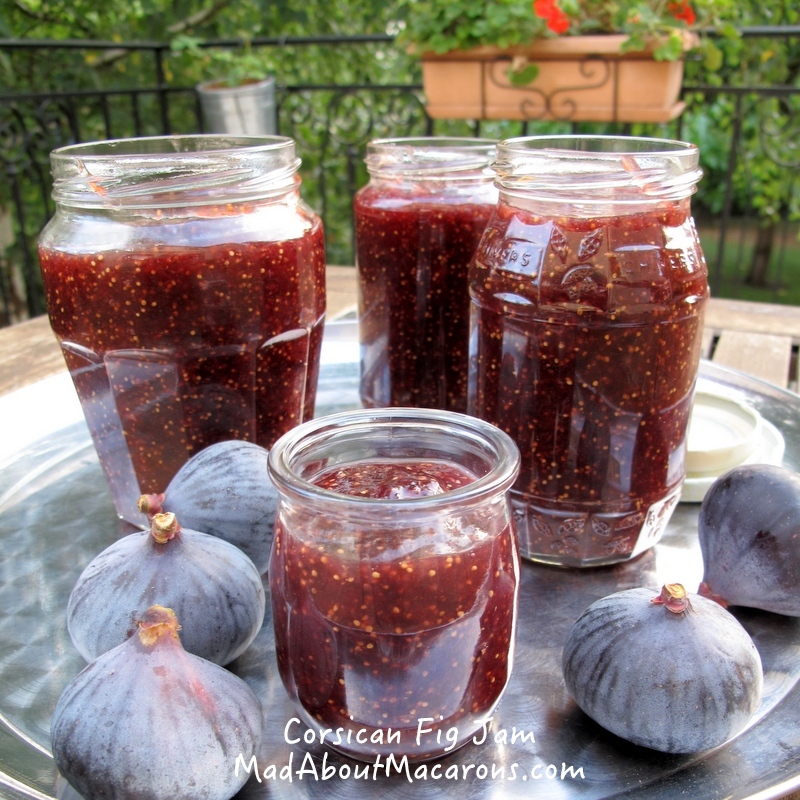 You’ll see from the recipe below that it takes up to 2 hours to cook the fruit, which is longer than I would cook other jams but the result is a beautifully rich, dark colour and the flavours of the figs just shine. Wash and dry the figs carefully using kitchen paper, as the figs must be kept whole. Cut off the top stem. In a large heavy-based pan or jam basin, bring the water and sugar (and orange blossom if using) to the boil. 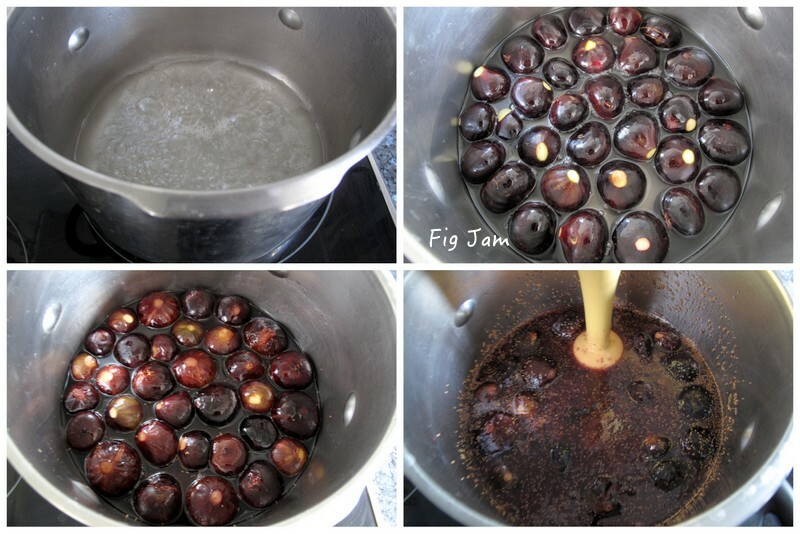 As soon as the bubbles start to burst and become bigger, add the figs carefully (watch you don’t get splashed!). Turn down the heat and leave the figs to bubble away for about 1.5 to 2 hours. Once the figs are transparent it’s ready to mix using a hand blender (or mix in a food processor). Pour into the jars and leave to cool before putting on the lids. I use orange blossom just to add my personal touch, but you can add a vanilla pod/bean and/or spices. Personally it’s great on its own! Also delicious served with Foie Gras or other pâtés. N.B. There’s no need to use special jam-making sugar with pectin. Just normal granulated sugar does the job well! 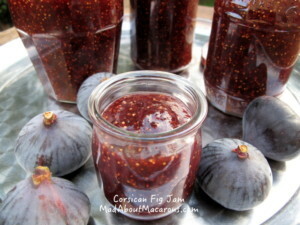 I have not tasted fig jam but it looks absolutely delicious Jill. What a great idea having it with cheese. Will definitely try it. I also like the idea of the digital jam scale. Will investigate. This jam reminds me of my nana’s fig jam (she used to add blanched almonds to hers). Bookmarked for when I can get my hands on enough of them! PS: Can’t wait to hear more about the scale – looked cool on IG stories! So interesting on the almonds added, Mardi. Glad you saw the Instagram Story today – yes, it’s quite a scale. I’m not into gadgets but I’m totally sold on this one. It even has a pause button and a timer …. and everything is just perfect for making jam! Made plum jam this morning and it was a treat.